Rock Transfer and Storage is known throughout the industry for the high-level of service we provide to our customers. We set the bar very high, and our competitors follow us. How do we do it? With our people. We value honesty and integrity and we believe that quality is obtained through consistent customer satisfaction. 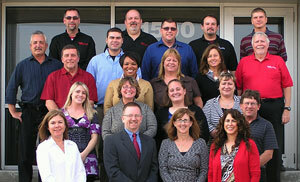 Our customer service representatives undergo continuous training on our services and our industry. Currently, our representatives have more than two decades of combined service at RTS, which gives them in-depth knowledge that’s hard to find elsewhere. We’re known for our professionalism, and we work at it every day. Your questions and requests are always handled promptly and professionally by talking directly with a live person, not a series of voice prompts.